Its lines are the result of the work of restoration made in 1730. One of the most beautiful fruit of this refinement is surely the construction of the two pavilions with loggia and big windows. The same refinement can be found also in the court where it is place the palace self, erected in 1484 by will of Cardinal Giuliano della Rovere and now seat of the Gallery Colonna. 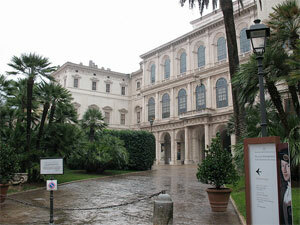 This gallery, together with the Gallery Doria Pamphilj, shows the most important private collection of Rome. The spectacular decorations of the big hall alone are enough to justify the visit. Inside you can admire paintings of Guercino, Niccolò di Liberatore, Giovanni Lanfranco and Francesco Albani, placed among wonderful frescos, stucco works and Venetian mirrors. Inside the palace you can also visit the waxworks (open everyday from 9.00 to 20.00). The Colonna Gallery is open only on Saturday from 9.00 to 13.00. Close in August . This is a three-hour small group walking tour of the Palazzo Colonna. Tickets are limited and each group will consist of 20 people maximum with your own guide - and are only available through Viator. Experience the artistic elegance of Rome between the 15th and 17th century, as you roam the Palazzo Colonna on this guided visit through its gallery and surrounding rooms. It has been continually renovated, rebuilt and redecorated by famous architects, Palazzo Colonna now reflects the various fashions and tastes of the numerous princes, cardinals and popes who've resided here. The construction of the palace began during the sixteenth century but in the seventeenth century it has been renewed by Borromini, who built also the wonderful staircase of the inside and the loggia of the first floor. Inside, it is worth a visit the Gallery of the Academy of Saint Luc, which offers an interesting panoramic of the Roman artistic production between '500 and '800. Here you can admire some of the works of Raffaello, Jacopo Basano, Canaletto, Antonie Van Dyck, and Pieter Paul Rubens. You can visit the museum every Monday, Wednesday and Friday and every last Sunday of the month from 10.00 to 12.30. It is closed in July and august. 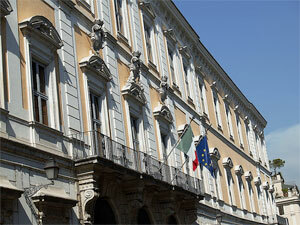 Barberini's is one of the most beautiful and imposing palaces dating back to the baroque. Its erection has begun in 1625 by Carlo Maderno with the help of Borromini. It has completed in 1633 by Bernini. Inside you can admire the elliptic staircase with its double colonnade, built by Bernini, and the gallery of art instituted in 1895 by Corsini for his collections. One piece of art of great artistic value is the Fornarina of Raffaello. 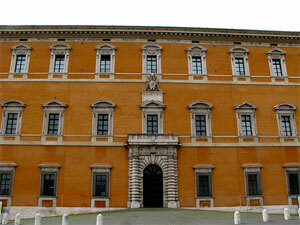 This is the last palace committed in Rome by the popes for their familiars. The erection was interrupted by the invasion of the French troops, in 1798. It was Pio IX who, seven years before, had ordered the beginning of the works. The works, directed by Giuseppe Valadier, began again in 1802. Its first planner, Cosimo Morelli, had been inspired by the classical architecture and had planned an interesting balcony that had to run all along the fassade of the palace. The erection of this palace has not been linear. It has been built in different phases between the 16 th and the 18 th century. All the descendants of the famous and noble family Doria have lived in this palace up to today. 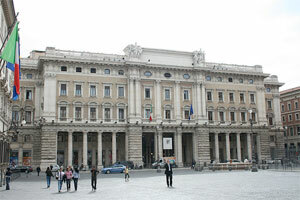 Remarkable is the wonderful facade of the palace, that can be admired from Via del Corso and, inside, the Gallery of art. 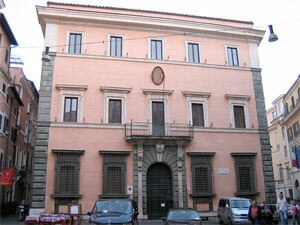 In this museum you can see some of the masterpieces of Caravaggio, Cigoli, Guido Reni and Guercino. The palace is open everyday from 10.00 to 17.00 except on Thursday. Discover the art and life of Caravaggio, a painter who left an indelible mark on Rome. This fascinating walking tour takes you to see Caravaggio's most characteristic masterpieces, and weaves a fascinating story with a tragic end. 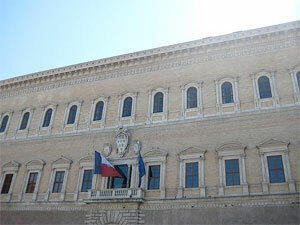 The palace was firstly erected in 1455-64 by order of Pietro Barbo as his personal residence. After his election as Pope Paolo II he had it amplified with the erection of another little palace, called palazzetto Venezia. 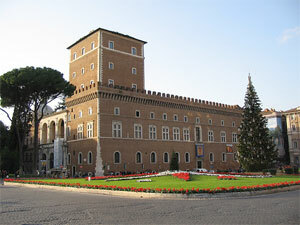 This little palace has been moved to the left side of the big palace after the construction of the Vittoriano. The palace represents the first example in Rome of the Renaissance style of Leon Battista Alberti.You can see it from the rectangular plant of the lodged court inside the palace. After 14 years of works, it has been possible to rediscover the Altemps's residence, erected in 1471 in place of the old houses and buildings of the Middle Age and organized, according the Renaissance canons, around an inner court circled by two loggias. The construction has been begun by Antonio da Sangallo the Old and by Peruzzi but was completed by Martino Longhi the Old. Inside you can admire the wonderful ancient sculptures collected by Ludovisi between 1621-23. The palace is open everyday from 9.00 to 19.45 except on Monday, the 25 of December and the 1 st of January. 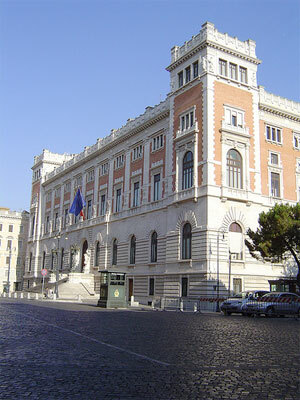 The Lateran Palace is named after the Lateran Pacts, that is the pacts that the 11 th February 1929 established the peace between the Catholic Church and the Italian Reign after 50 years of wars. The sixteenth-century palace has been planned by Domenico Fontana for representative functions. 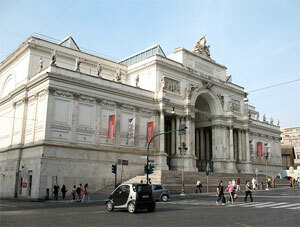 In 1867 this is also the seat of the Historic Vatican Museum. The museum can be visited every Saturday at 9.15, 10.30, and 12.00 and the first Sunday of the month from 8.45 to 13.00. The erection of this palace dates back to 1653, when Pope Innocenzo III commissioned it to Gian Lorenzo Bernini. Inside you can admire many beautiful paintings of Carlo Carrà, Giorgio de Chirico, Lorenzo Viani, giovanni Boldini, Massimo Campigli. Since 1871 this palace is seat of the Chamber of Deputies. 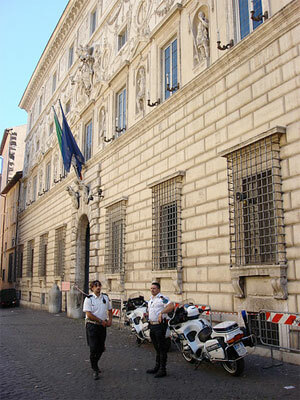 Palazzo Chigi is famous in Italy because seat of the Cabinet. The rigorous palace has been built in 1580-86. Since than many families have lived inside the palace. 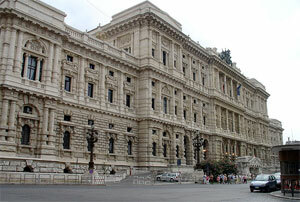 In 1659 it has been occupied by the Chigi family, who added to the building a beautiful court and a staircase. During the 18 th century they opened the big door on piazza Colonna and enriched the inside with precious decorations. 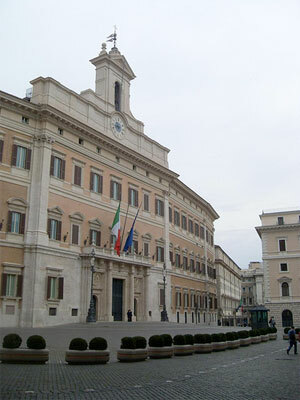 Bramante terminated the construction of the Chancellery Palace in 1513. 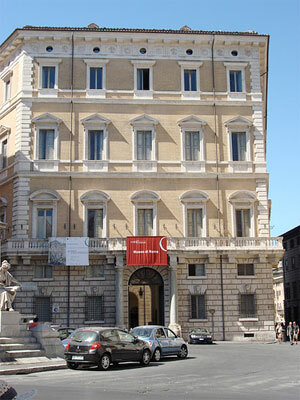 Cardinal Riario, in fact, had committed the best architect of his time for the building of his residence. It can not be said for sure who is the architect of the entire building. 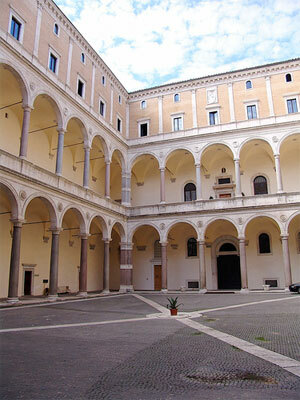 The court is certainly a Bramante's work. Palazzo Spada has been erected in the middle of the XVI century by Borromini, who realized the famous perspective gallery. Viewed in perspective the gallery seems much deeper than it really is. In the Gallery you can admire the paintings that belonged to the private collection of Cardinal Spada. The paintings are placed in four big and beautifully frescoed halls. The halls are enriched with ancient pieces of furniture and marbles. The most interesting works of art are placed in the third hall. The Gallery is open everyday from 9.00 to 19.00 and on Sunday from 9.00 to 13.00. Close on Monday. The palace, erected on the homonymous square and decorated with two beautiful fountains, has begun to be erected in 1517 by Antonio da Sangallo the Young for Cardinal Farnese, future Pope Paul III. 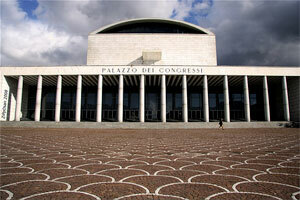 After the architect's death the construction has been assigned to Michelangelo and Vignola. But it was giacomo della Porta who, in 1589, ended the building. 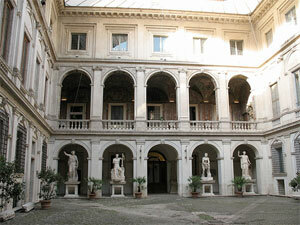 Inside you can admire a wonderful court, built by Sangallo and Michelangelo, decorated with an arched porch. The gallery has been frescoed by Annibale Carracci and Domenichino with the "Triumph of Love over the Universe", that marks the passage from the mannerist to the baroque art. This is the old seat of the University of the Sapienza founded in 1303 by Bonifacio VIII. In 1935 the seat has been moved to the campus. Inside the building, began in the Sixteenth century and terminated in the first years of the following century, you can visit the documents of the Papal State. Also Borromini contributed to its erection building, in 1632, the church of St. Ivo. The church rises at the end of the court, among the most representative works of the baroque art. It is worth a visit the beautiful spiral dome built by Pietro da Colonna, great exponent of the seventeenth-century art. This is the place that witnessed the birth of the Arcadian movement, supported by Christine of Sweden, who has lived all her life long in the palace, till her death in 1689. The literary movement, that pursued the aim to purify Italian poetry, had a great influence in Italy during the eighteenth century above all through Metastasio's work. The numerous institutions placed in the building, erected in 1510-12 and renew during the eighteenth century by Fernando Fuga, successfully keep memory of the literary Academy. 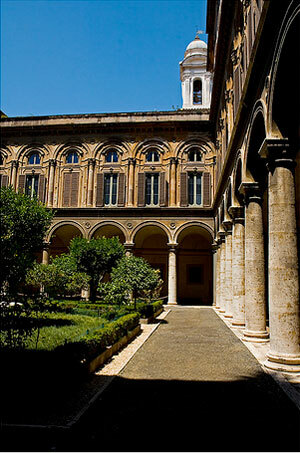 Beyond the Corsini Gallery it is to mention the National Academy of lincei, the greatest Italian cultural and academic organism, founded in 1603. 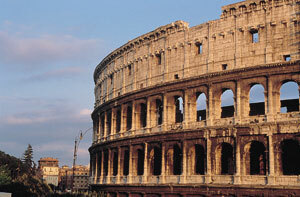 If the Colosseum is the symbol of Rome, the square Colosseum is the symbol of EUR (Universal Exposure of Rome), one of the most modern and exclusive quarter of the city. The palace is called because of the 216 arches that almost obsessively run along the fa H ades of the building, erected in 1938-43 by Giovanni Guerini, Tawny Ernesto, il Padula, and Romano Mario after will of Mussolini. This is one of the most imposing and famous of all the palaces of EUR. 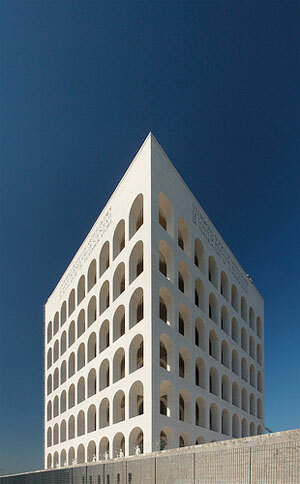 The Palace of Conferences represents the melting of modern technologies and materials with the classic inspiration that was requested during the Fascism. The hard work has been successfully realized by Adalberto Libera between 1938 and 1954. Outside the palace appears as a simple, white cubic volume while inside there one a beautiful and rich hall, a congress hall and even an open-air theatre. The original plan of the palace represents the triumph of the will of scenic and spectacular of the Fascistic Age. But the arch of duralumin with a light of 330 meters planned by Adalberto Libera was not completed and the area where it was supposed to be built remained free until the period of the Olympic Games, in 1960. By this happening the plan created by Pier Luigi Nervi and Marcello Piacentini took form and the building has been since than exploited for both sport and politic happenings. The Palace of the Exposures was erected in 1877 by Piacentini, and is characterized by a frontal white facade without windows. Inside you can admire the most representative and powerful works of the industrial art, painting, sculpture and architecture. The sculpture is best represented by the two high relieves of Cimabue and Laocoonte, I Festeggiamenti per la Madonna and Il Ritrovamento. The Palace of Justice, erected in 1888-1911 by Guglielmo Cauldrons, is the seat of the Supreme Court. Romans call the building; Palazzaccio" because of its huge dimensions and exaggerated decorations that weight down the architectonic lines.